The Diamond Hall at the University’s Coleraine campus featured prominently at the Royal Society of Ulster Architects award ceremony in Belfast last week when it received the Society’s prestigious Wood Award. It was the second public recognition the project had gained for its use of timber. 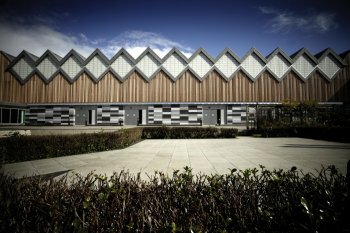 In autumn 2011, architects Samuel Stevenson & Sons received the 2011 Wood Award for the design of the refurbishment at the Diamond. The national award was announced at the Timber Expo held at Coventry’s Ricoh Arena on 27 September. The building was included in a short list of 30 out of a record 348 entries across 5 categories and was declared winner of the ‘conservation/restoration’ category. The RSUA awards also saw the Diamond project receive a commendation in the “Between £250,000 and £2.5m” project category. The Diamond project is just one among many infrastructure renewal projects the University has undertaken at its Coleraine campus in recent years. Over £40 million has been invested in construction on the campus over the past decade, on projects including the Centre for Molecular Biosciences, the Centre for Coastal and Marine Research, the Cranagh Student Village, the SAAD Centre for Pharmacy & Diabetes, and more. News of the award for the Diamond comes as the University prepares to demolish two vacant blocks of the South Building complex to make way for a new £5m development. The South Buildings complex was constructed in the mid 1960s and comprises a series of inter-linked blocks. It is of prefabricated design, is energy inefficient, and at the time of its construction had a specified “economic life” of 40 years.